see complete MardiGrasParadeSchedule.com archive here! The Krewe of Orpheus has mesmerized the crowds who jam the streets of New Orleans awaiting its arrival. From its founding in 1993, Orpheus has consistently stunned the revelers on Lundi Gras, the night before Mardi Gras, and has exploded as one of the largest Krewes. Since that first ride, Orpheus has been one of the most eagerly anticipated Mardi Gras parades of the season. Experience a side of Mardi Gras seldom seen by New Orleanians or visitors, and join us for the Orpheuscapade. This black tie event begins with live music and dancing until the magic moment when the gigantic floats arrive. As the entire parade rolls through the Convention center, guests are showered with beads, doubloons, and other throws that fly fast and furious from the magnificent floats. Festivities start at 7pm and last until 2:30am. Formal attire is required. Tables are round, seat 10 people and are assigned on a first come basis. You may bring your own liquor, and set-ups are provided at the table: soft drinks, tonic, soda, cups and ice. Food service begins after the parade has completely entered the Morial convention center. 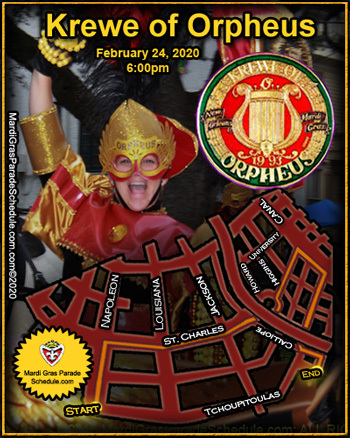 The Krewe of Orpheus derives its name from the mortal Orpheus, son of the god Apollo and the muse Calliope. The story of Orpheus illustrates the power of music in both this world and the next. Legend is that Apollo presented Orpheus with a lyre, which he played with perfection. The music of Orpheus was so beautiful that wild animals and ceased their hunting, mountains bowed, seas stopped spraying and trees bent near to listen when he sang. His music was celebrated and cherished by all who heard it. His melodies inspired the noblest love. When Orpheus sang every heart was opened. Since it's founding in 1993, Orpheus has consistently stunned the revelers on Lundi Gras, the night before Mardi Gras, and has exploded as the largest new Krewe in the past 30 years. Since that first ride, Orpheus has been the most eagerly anticipated Mardi Gras parade of the season. According to the best-known tradition, Orpheus was the son of Oeagrus, king of Thrace, which in pre-historic period seems to describe a wider region from Olymbos to the Hellespontos Straits, as the Orphic texts (Argonautica) point out that Orpheus was born in Mount Helicon at Livithra (Pieria), and that his mother was Calliope, the Muse of epic poetry. In other traditions, Calliope and Apollo were his parents. Orpheus learned music from Linus, or from Apollo, who gave him his own lyre (made by Hermes out of a turtle shell) as a gift. Despite Orpheus's Thracian origin, he joined the expedition of the Argonauts. Centaur Chiron had warned Argonaut leader Jason that only with the aid of Orpheus would they be able to navigate past the Sirens unscathed. The Sirens lived on three small, rocky islands called Sirenum scopuli and played irresistibly beautiful songs that enticed sailors and their ships to the islands' craggy shoals. Once shipwrecked on the rocks, the sailors were destroyed by the Sirens. However, when Orpheus heard the Sirens, he drew his lyre and played music more beautiful than that of the Sirens, thus drowning out their alluring but deadly song. Orpheus’ greatest feat involved his beautiful wife, Eurydice. Shortly after their marriage, Eurydice was pursued by Aristaeus, who was overwhelmed by her beauty. When fleeing his advances, Eurydice stepped on a snake, which bit her foot, and she died. Overcome with grief, Orpheus vowed to rescue her from the regions of the dead. He gained entry to the Underworld by using his music to charm Charon, the ferryman and Cerberus, the three headed dog that guarded the gates of Hell. He passed through crowds of ghosts, and presented himself before Hades and Persephone. Orpheus strummed his lyre as he implored them to return Eurydice to the realm of the living. As he sang, the ghosts wept and the cheeks of the Furies became wet with tears. The yearning notes from Orpheus’ lyre had kindled their memories of the sweet secrets of life’s pleasures. At last, Eurydice was called forth. Orpheus was permitted to take her away, on condition that he should not turn to look at her until they both reached the surface. They traveled through dark waters and passages, in silence. They had nearly reached the surface and shafts of sunlight began to illuminate the cavern. In a moment of longing, Orpheus cast a glance behind him. But, Eurydice was still in darkness, and she was instantly carried away. They reached for one another, but only grasped the air. Eurydice was lost to Orpheus forever. Touched by the charm and power of the music of Orpheus, Zeus turned his lyre into a constellation. Orpheus still inspires lovers, at night, as they gaze upon his stars.